ALLEN HOTEL – 411 EDDY ST. 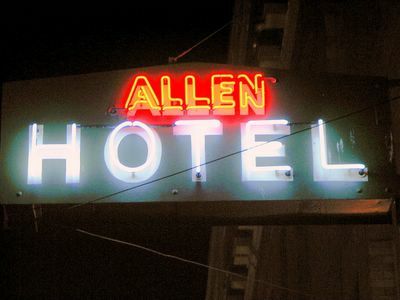 The little neon sign for the Allen Hotel is cookie-cutter signage — it could just as easily read "Bates Motel". This is precisely why I like this sign, even though it is very plain. The sign for the Nazareth Hotel is plain too, but it lacks the generic quality of the Allen's sign. 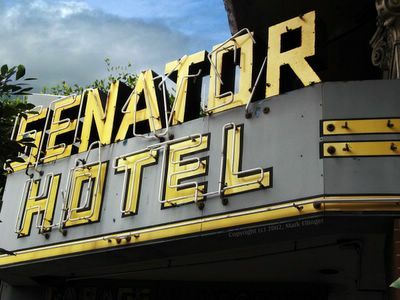 This type of neon hotel sign is virtually an American icon, deserving of a place in the Smithsonian. The Marathon's portal has been terribly abused by the owner and yet it is still beautiful to me in a haunting, almost morbid way. The stonework is soft, porous sandstone, so the yellow paint is now a permanent part of it. It is hard to imagine why the entrance lamps were removed, although I suspect that the process of removal was violent. What grates against my soul is the obvious fact that everything which degrades the former elegance of this entrance was done out of sheer, crass commercialism. ADMIRAL HOTEL – 608 O’FARRELL ST.
1916. Architects: Faoulkes & Lowe. 6 stories, stucco facade, fan-shaped marquee. Tall, pink, wide and sporting a cornice that looks positively aerodynamic, the Admiral Hotel is anything but subtle. The fan-shaped marquee over the entrance is rather special, too. At one time the Admiral was fairly classy as residential hotels go, but its still-elegant exterior belies how seedy the interior has become. Unfortunately, a fairly nice-looking exterior that hides living conditions ranging from sub-standard to outright hellish is typical of residential hotels these days, although as non-profit housing companies take over more of these hotels this is slowly changing. The comparatively tiny structure to the left of the Admiral is the building featured in Time Portal. From a Market St. sidewalk perspective, the "Furniture & Carpets" building’s huge, monotonous expanse of brick is mostly hidden by the buildings on either side. The illusion created by the false front is largely dependent on looking upward at the building from street level. The faux columns with Corinthian capitals were constructed with terracotta tiles and the entablature these columns support, that seems so massive, is just a hollow, metal box. Architecture like this is for me transcendent. It turns the street into a stage set. This is probably why I like being able to see the entire building. The deus ex machina, you might say, is the utilitarian brick walls that make up the "real" building behind the facade. 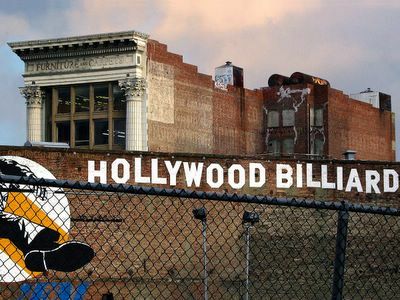 The rough, brick wall advertising Hollywood Billiards used to abut a theater that was razed to make way for... a parking lot. After the Senator's neon sign was restored, I anticipated the eventual restoration of the marquee. First, I needed some images that showed its dilapidated condition. Several years passed after I took this photograph. The marquee was at last removed, but instead of being restored, it was replaced with a much smaller, plywood mock up — a poor imitation of the original marquee. I took this photograph shortly before work was begun that involved constructing a completely new building behind this facade. It is now the main concert hall, rehearsal rooms and library of the relocated S.F. Conservatory of Music. 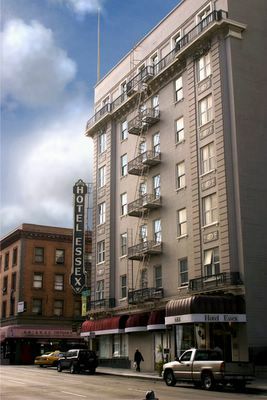 HOTEL ESSEX – 684 ELLIS ST.
1912. Architects: Righetti & Headman. 7 stories, stucco facade, corner pavilions, large intact lobby. The Essex exudes a certain air of grandness because of its size, but the stodginess of its overall design knocks it down a few pegs. The neon sign, however, helps to make up for what is lacking in the building's design. This photograph accompanied a short article in a neighborhood monthly newspaper about a fire in one of the Oasis' rooms that had been extinguished by the automatic room sprinkler before the Fire Department arrived. 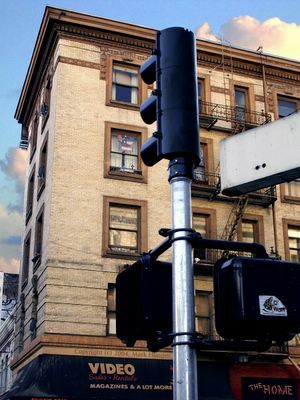 A two-year struggle by housing activists to have sprinklers installed in all the rooms of every residential hotel in San Francisco was at its peak, making this a newsworthy event. I just happened to be walking by the Oasis during this little drama, so I was able to watch it unfold. I took pictures and briefly interviewed the battalion chief, all with a view toward submitting a brief article to the neighborhood monthly along with three or four photographs. The editor chose this picture to accompany the article even though it had virtually nothing to do with the story other than being a photograph of the building where the fire occurred. 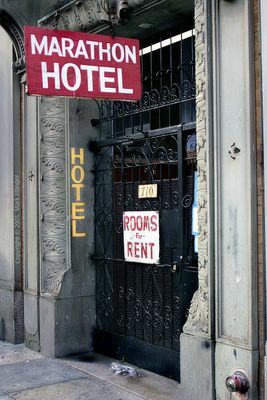 YALE HOTEL – 633 LARKIN ST.
(formerly Erleen Hotel). c.1911. Designer unknown. 3 stories, stucco facade, entry altered. 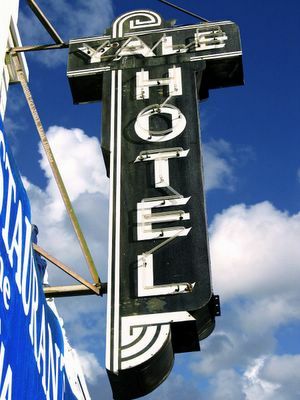 The distinctive Deco motif that defines the look of the Yale Hotel's sign was apparently the hallmark of a particular neon sign company, because there are other SROs scattered thoughout San Francisco with signs that are so similar to the Yale's as to be almost identical. When I photograph a building the sky is just as important to me as the building itself. I dislike clear, azure skies even more than I dislike the gray-white monochrome of overcast skies. Turbulent, cloudy skies that are full of motion and constantly changing light make me feel happy just to be alive, and when I am taking photographs such skies strengthen the emotional link to my subject matter by adding depth and color to the setting. For me, a cloudy sky at sunset is the penultimate setting for taking pictures. I am also strongly influenced by the seasons, and the season that affects me most profoundly is autumn. The waning light of the sun was a perfect frame of reference for this old building, as both a day and a year came to an end. 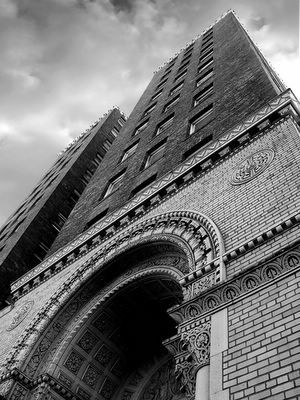 ALDER HOTEL – 175 6TH ST. The Hotel Alder's sign is a perfect example of a sign with very close family ties to the sign that adorns the Yale. While the Alder's sign is several times larger than the Yale's and is green rather than black, the similarities between the two signs are very strong and immediately apparent. I have developed an attachment to this family of hotel signs. They represent for me a time when living in hotels was not just acceptable, it was how most people in San Francisco lived. This unusual building was at one time the Grand Lodge of the International Order of Odd Fellows. It was built as a replacement for the original lodge that was destroyed during the 1906 earthquake and fire. While their Grand Lodge is now in Sacramento, the Odd Fellows still have their Apollo Lodge #123 in this building, although exclusively they no longer use it. 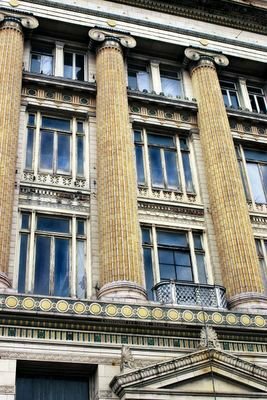 From the time I first laid eyes upon this building, I have admired it; partly because it is such an odd-duck hybrid, partly for its name, "Odd Fellows", and partly for the wonderful three-story-tall terracotta panel illustrating the Odd Fellows' symbols. If you look closely at this picture, you will notice that I managed to get three "odd fellows" into it. The original Odd Fellows Hall (1885). Here is a closer view of the Odd Fellows Temple's unusual windows. In the background is the old Federal Building, to be abandoned after completion of the new Federal Building in 2007. Albert Pissis (rhymes with "crisis"), an architect whose work changed the face of San Francisco in the late nineteenth century, designed the Hibernia Bank Building, completed in 1892. The building suffered heavy fire damage following the 1906 earthquake, but it was soon after repaired. Architect and Engineer reflected in 1909 that "the (Hibernia Bank) became famous at once and marked an epoch in San Francisco architecture and placed its designer in the forefront of his profession, where he has remained ever since." After it was vacated by the Hibernia Bank, the building was the headquarters of the SFPD Tenderloin Task Force until the new Tenderloin Station was finally completed. An out-of-town speculator bought the building in 1995 and has left it empty and unmaintained ever since. Rain pours in through broken skylights onto polished marble and wood and large portions of the exterior have become stained and discolored. This prominent landmark, which should be a proud showpiece of the central city, has instead become a neighborhood blight. View from the old I.O.O.F. building (1895). After the earthquake & fire (1906). I have a particular fondness for these lamps because the father of a close friend of mine was a blacksmith, and a master of his craft. I loved talking with him, for not only did we share an appreciation of form and style, we both derived great pleasure from analyzing how things were put together and what made them work. These serpentine lines of bronze, perfectly repeated, always make me think of Mac. I Have Looked For The Authors Name. I Find Nothing.I Feel I Know Who it is.Hi Mark.You are No Doubt the One Who would do this.Mark Ellinger the City is Lucky To Have had Someone Like You.You LIved through Hell.Some Self Inflicted and Came Out a Damn Good Person.